Standing Cypress, Ipomopsis rubra, Seeds. Hummingbird Favorite! Red Wildflower. 200+ Seeds. This Texas wildflower is terrific for attracting hummingbirds. The scarlet-red, trumpet-shaped flowers bloom on tall stems in mid to late summer. A biennial, usually sown in the fall in the south, but it may bloom the first year from seed if started early, so it can be grown as an annual. Very easy to grow -stands heat and drought with ease! 200+ Seeds of Standing Cypress, Ipomopsis rubra. Brilliant scarlet tubular flowers along the entire length of a single, 3? - 5' erect spike are a hummingbird magnet! Very finely divided foliage makes a low rosette the first year, bloom spikes come in year 2 and are well worth the wait! These may bloom the first year if started early. These are especially striking when planted in a large group (and they help to support each other that way, too, since they grow so tall). Hardy in zones 6-11 this superstar blooms from June through first frost and is a favorite of hummingbirds and butterflies. I first encountered these plants growing along I-10 in northern Florida, so you know they have to be tough! 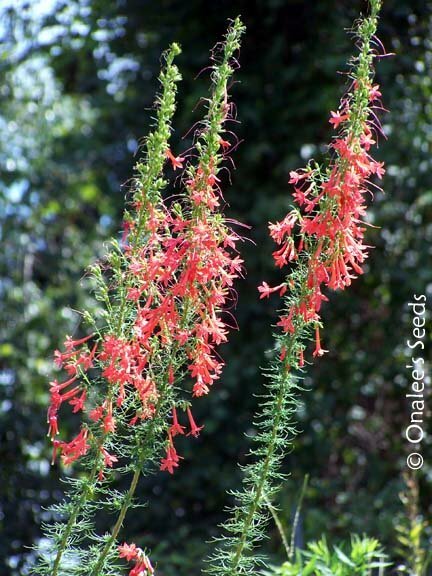 Standing Cypress loves heat and sandy, well-drained soil and is very drought tolerant once established.